So I’ve noticed in Sierra that some of its “helper processes” (apps that run in the background to do various tasks) will occasionally start using 100% CPU for no reason. 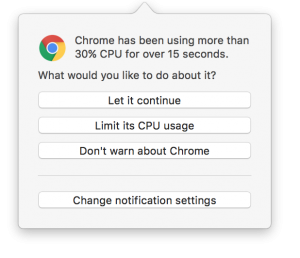 In particular, I’ve seen the com.apple.appkit.xpc.openAndSavePanelService process stay pegged after a file dialog is done – it just sits there and consumes CPU while doing nothing. Quitting the app that was showing the file dialog will stop the CPU-hogging, but it otherwise continues indefinitely. I’ve been wondering if this might actually be the source of the much-talked about Consumer Reports findings that the new MacBook Pros have very inconsistent battery life. Their results varied widely from test to test (on the same computer) – maybe one of the WebKit helper processes was just flipping out once in a while due to some underlying bug in Sierra’s interprocess communication or process management services. While that’s just my own random speculation, the issue of processes running amok seems to be a recurring annoyance to some folks. 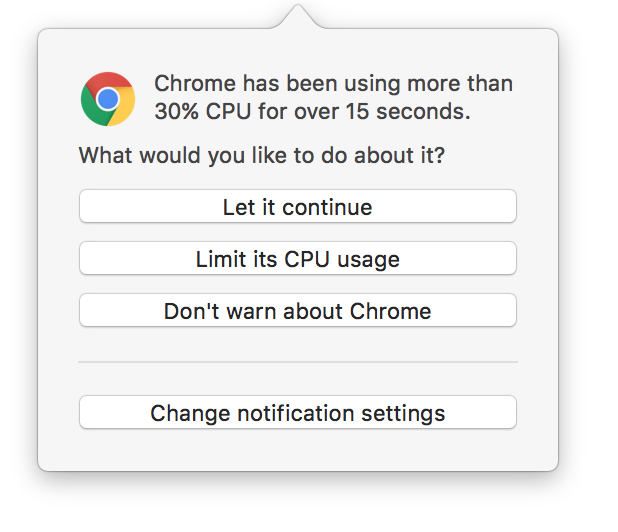 To help you detect this sort of stuff, I’m adding an option in App Tamer to notify you if a process starts consuming excessive CPU time. If it does, it gives you the options shown in the screenshot. Can’t hurt, right? Shoot me an email (AppTamer at stclairsoft dot com) if you’re interested in trying it out and doing a little testing for me. Default Folder 5.1 is now available, and includes a long list of changes. Key among them are new commands that let you copy, move, and make aliases to files and folders right in your file dialogs. Want to save a copy of that file to your Desktop folder before you make changes to it? Just use the Copy command in Default Folder X’s toolbar and choose the Desktop as its destination. 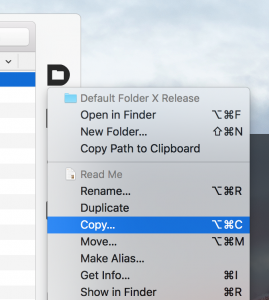 There are other convenient additions as well, like the ability to change the creation and modification dates of files and folders, and Command-selecting an item from a Default Folder X menu to reveal it in the Finder. For a complete list of changes, bug fixes and download links, check out the Default Folder X Release page!